The jewel of Fiji’s northern islands, Qamea is a breathtakingly beautiful island of dramatic tropical-rainforest-clad hills and white sand beaches. Qamea Resort and Spa is an intimate boutique resort catering to a maximum of 34 adults with only 17 luxuriously appointed, air-conditioned, beachfront bures and villas nestled among swaying coconut palms and lush tropical gardens. All accommodations are beachfront with sweeping views of the ocean and sunsets. Qamea also has an all-new, award-winning, full-service spa. A spa menu is available upon request. 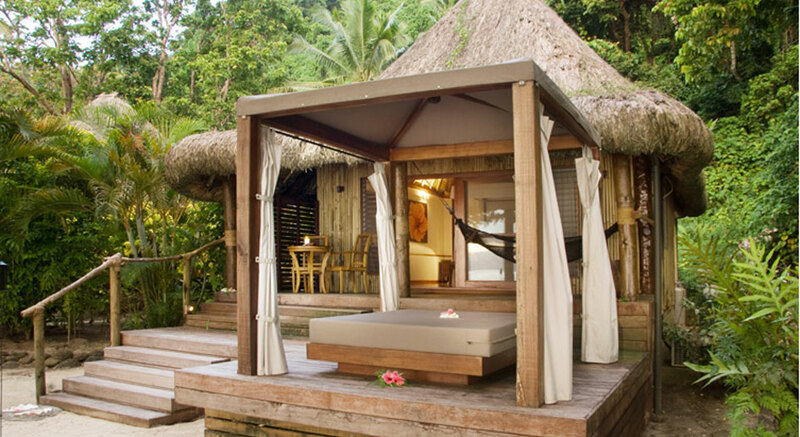 Qamea Resort and Spa offers 11 Beachfront Bures along their lovely lagoon, two more private Honeymoon Bures, the Honeymoon Villa which is set back a bit from the beach, and three Royal Beach Houses (one of which is two-bedroom). All are private, spacious, and with very upscale décor. All meals are included at Qamea Resort and Spa. Select Beverages are included including select beers, wines and softdrinks (by the glass at the bar), and cocktails and premium wines or foreign beer is available for an additional cost. There are also various options in addition to the lovely dining room, such as dinner on the beach or in your bure, your private villa, or a picnic luncheon with champagne on a private beach. Qamea Resort and Spa offers three wedding packages. They range from simple to more elaborate in Fijian style; the staff is also willing to take special requests. The number of weddings is limited in any given week so that each one is very personal and special. Most non-motorized activities at Qamea Resort and Spa are available at no extra charge. The snorkeling and diving in the area is some of the best in the world. Qamea’s dive shop offers some of the best expertise and (as of this writing) Qamea is the only resort offering a nitrous-dive option for those more experienced divers. Private deep-sea-fishing charters and hand-line fishing are available; a guide can be arranged if necessary. For surfers there is an excellent surf break near the resort as well. There are many other activities available for a nominal fee such as visiting beautiful waterfalls. Children under the age of 16 years of age are not permitted at the resort, unless the entire resort is booked by a private party. As our valued clients, you will receive a fresh flower lei greeting upon arrival and entrance into Fiji Airway’s Airport first class VIP departure lounge on your last day – when you book your flights and accommodations with us.